This section will help you better understand “low ink” warnings and nuisance alerts which appear after refilling and then re-installing a HP 65 (or 65XL) cartridge into the HP Deskjet 3720, 3752 and 3755 printers. 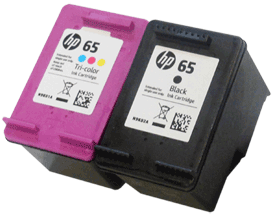 NOTE: “Empty” and “Low Ink” alerts are COMPLETELY NORMAL for HP 65, 65XL ink cartridges which have been refilled! While at first this may be an unusual workflow, it does allow print operations to proceed. In many cases both ‘Ink Out’/’Low Ink” and ‘Nuisance’ alert messages will be displayed, including ‘counterfeit cartridge’ or ‘non-genuine ink cartridge’…these are normal nuisance alerts that can just be ignored by pressing the Resume button. You should be able to continue with print operations until the print quality begins to fade. Select ‘Ok’ to bypass “Low Ink” messages displayed on the computer. If the computer displays the following message, select ‘No’ to bypass warning prompt. 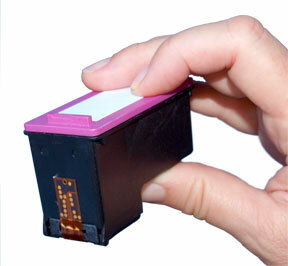 Once a cartridge is inserted into your printer, the printer begins to track the ink used for that particular cartridge. When a cartridge has used about 80% of its ink, the printer may begin to send the user “your ink level is low” warning messages. After the cartridge is refilled, the printer may continue to send out these warning messages. These warning messages may simply be ignored, and the printer should continue to operate normally. 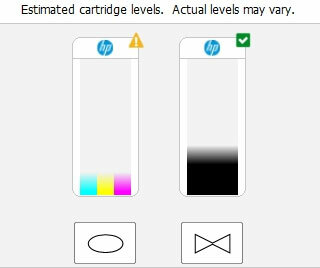 Unfortunately, the low ink alerts cannot be reset when using refilled HP 65 cartridges. Following HP 65 (65XL) ink refilling, the printer cannot track the ink levels. The ink level indicator will falsely signal as empty. If the printer/software prompts you to align the cartridge, it is strongly suggested that you perform the alignment at the printer’s control panel (i.e. 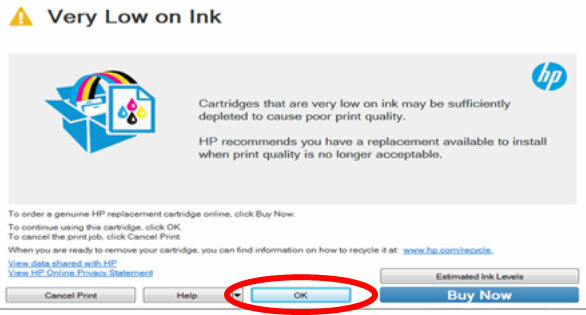 select ‘Ok’) instead of using the HP Solution Center software as this often fails when using refilled ink cartridges. You may have to depress the printer’s ‘OK’ (or resume/scan/copy depending on printer model) button up to 2-3 times to bypass the various internal alerts to allow scanning. If any streaks or missing colors appear on prints, thoroughly clean the cartridge’s electrical contacts and printer’s flex driver cable surface. If the cartridge is clogged then a warm water flush may be necessary to recover all colors. Click here for instructions. For all other error messages, or if the printer appears to ‘freeze’, please refer to ‘HP 65 Ink Cartridge Errors’ page. CAUTION: It is suggested you avoid purchasing ‘compatible/clone’ ink cartridges as they can be quite problematic. The smart chip (at base of cartridge) may not provide reliable printer-cartridge connectivity once installed. Compatible/clone cartridges are typically purchased on-line (i.e sold under a different label than the manufacturer) and is essentially a “knock-off” ink cartridge of the OEM (original/genuine) ink cartridge. For the best refilling experience, only use OEM original/genuine ink tanks or remanufactured OEM cartridges which have been cleaned, refilled and tested for proper performance.